Adding a new user process is quite similar, almost identical to adding a new domain. 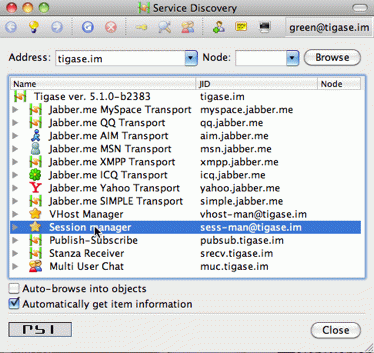 This time, however we have to select Session Manager in the service discovery window. Double click on the Session Manager and a window with SM’s commands list shows up. Right now, there is only one command available to domain administrators - Add user. I am going to make available more commands in the future and I am waiting for your suggestions. If you click Execute a window presented on the left shows up. Fill all fields accordingly and press Finish. 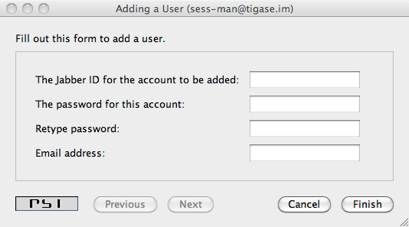 If everything went well you have just added a new user and you should get a window confirming successful operation. If something went wrong, a window with an error message should show up. Possible errors may be you tried to add a user which is already present, or you may have tried to add a user for a domain to which you do not have permission or to non-existen domain.